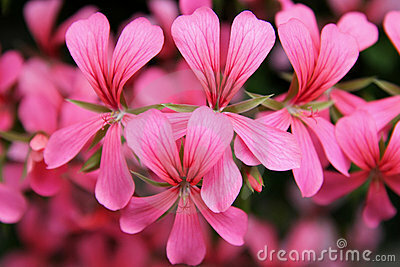 Geranium is the popular name of a genus of flowering plants called Pelargonium which contains about 200 species. 20 of these species have become very popular for gardening and there are curently aviable hundreds of cultivars. The names of these cultivars varies with the nursery which produces them, hence very difficult to asset. As far as I could identify the image depicts an ivy leaf type of cultivar with cascade type of pink flowers. Looks great if converted to black and white.